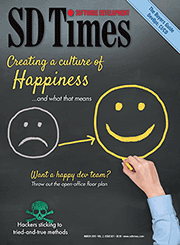 SD Times is the monthly magazine for the software development industry. With a mix of news, news analysis and features, it should be the first place you tell your story. Our primary focus is to inform our readers about the latest news within our industry, and what that news means for enterprise software development managers and test and QA managers. Coverage in SD Times depends on a news item’s relevance to our audience and its timeliness. With the exception of our Guest Views, SD Times editorial content is entirely written by our staff editors, regular columnists and a small team of regular outside writers. Please visit our separate Guest View Guidelines page. News about your company, products and people should be sent to editor-in-chief David Rubinstein at drubinstein@d2emerge.com. Your news does not need to be presented as a formal press release, and there is no standard format that we require for letting us know about news. Due to the amount of news being generated by the software development industry, SD Times is not able to pursue every news item submitted by companies in our market, and cannot acknowledge receipt of your press release or news announcement. SD Times prefers to be pre-briefed, whenever possible, about upcoming news, so our reporting can be as timely as possible. The ideal lead time for a prebriefing is two to three weeks prior to your release date. In some cases, we are willing to be briefed under an embargo, but for your own protection, check with editors before revealing embargoed or not-for-publication news. We cannot be responsible for protecting confidential information sent to our reporters without our prior consent to the embargo. The lead times for news in SD Times is about six weeks for print. Of course, we can publish news items to the sdtimes.com website the same day. The lead time for our News on Monday electronic newsletter ranges from one to four days prior to publication. When submitting news to SD Times, please be prepared to provide high-quality graphics, including screen shots, product photography and pictures of those individuals available for briefing. The use of these graphical materials is up to the discretion of the editors. Most issues of SD Times contain a Special Report, which is an in-depth feature written by a staff writer or by one of our regular contributors. A list of upcoming Special Report topics can be found on our editorial calendar. It is common practice for marketing and public relations staff to request detailed information about the topics and writers of upcoming Special Reports, and to offer interviews with their executives. We appreciate your interest, but may not be able to accommodate your request, due to the large number of these requests that we receive. Also, not all topics lend themselves to vendor coverage or commentary. We do not provide detailed information about the Special Report direction for competitive reasons, and also because the angle of a Special Report is fluid until the research and reporting is complete. While we acknowledge that marketing/PR staff would prefer to pitch our writers directly about including their client in our Special Reports, this is not an efficient practice for SD Times due to the large number of queries we receive. Therefore, we do not release the names or contact information for writers working on specific Special Reports. Instead, we have evolved a standard procedure for accommodating Special Report queries: Send us a message and we will relay it to the writer of that Special Report. If the writer wishes to follow up on your query or interview request, he or she will respond to you directly. Due to the large number of queries we get for every topic, it is not assured that you will have a response from the writer. Repeated queries and follow-ups may be counterproductive. You can send Special Report queries to David Rubinstein, Editor-in-Chief, at drubinstein@d2emerge.com. We advise sending such queries two to three months in advance of the cover date of that Special Report’s issue. Each spring, SD Times recognizes the companies, organizations and individuals that demonstrated the greatest innovation and leadership during the previous year. Learn more here. The software development industry is tremendously interconnected, and therefore, editorial beats on SD Times are somewhat loosely defined. Also, because news isn’t always spread evenly across beats, the editors and reporters of SD Times often work across other beats. Here’s a rough guide to coverage areas. If you are not certain who to contact, start with David Rubinstein. It is the policy of SD Times to correct factual errors in a timely fashion. If you believe that SD Times has published a factual error, please contact David Rubinstein, drubinstein@d2emerge.com. SD Times often publishes graphics to accompany its news and analysis stories. We typically request screen shots and “head shots” of people who we interview. Graphics should be sent directly to the reporter or writer who requested them. Many images copied into Microsoft PowerPoint presentations or Word documents are not suitable for use in SD Times. Please send us the original artwork, such as screen shots or Adobe Illustrator graphics, if possible. Screen shots should be sent to us as native unaltered bits, in BMP or TIFF formats.Please do not save them as GIF or JPEG files – those formats compress files by throwing away bits, and therefore produce distorted images with blurry text and muddy colors. Because BMP and TIFF files can be very large, compress them using ZIP or StuffIt before e-mailing them to SD Times. Head shots or other non-screen-shot artwork should be sent as megapixel resolution TIFF or JPEG files. For pictures of people, professional photographs of the subject are preferred, but are not required. If you are taking the photograph with a digital camera, place the subject in a well-lit area. Backlighting (i.e., standing in front of a window), the use of on-camera flash and a busy background all detract from the quality of the photograph. Please do not edit or alter the photographs or screen shots using Photoshop or another image editing product. Instead, send us the unaltered, uncropped digital image. SD Times’ editorial calendar is available for viewing. The editorial calendar is subject to change without notice. Advertising plans, past, present and future, do not influence editorial coverage in SD Times.While developing your marketing plans, you may have discussed your upcoming news with an SD Times advertising sales representative. In order to protect the confidentiality of your business strategy, and to reinforce our editorial objectivity, the sales team does not share your product plans with the editors or reporters of SD Times, or pass messages from advertisers or advertising prospects to the editors. If you wish to communicate with our reporters or editors, you must do so directly. When submitting a photograph for editorial consideration, follow our Photo Guidelines. See the Guest View Guidelines.